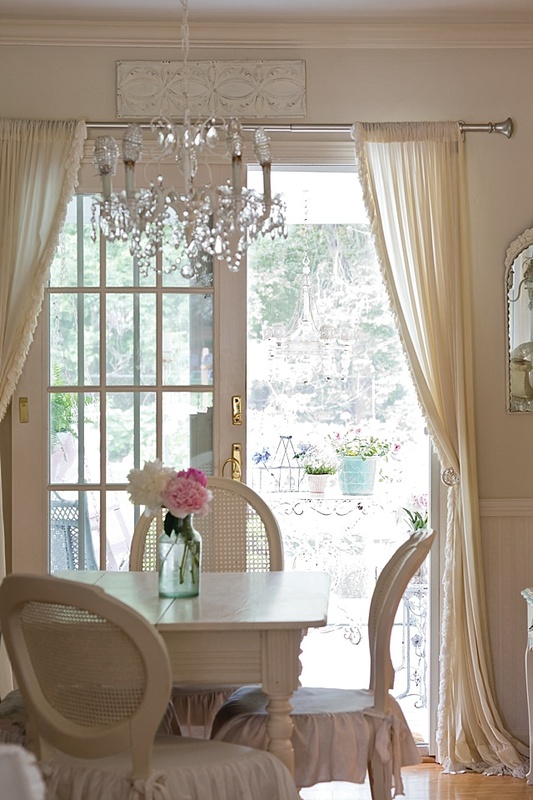 Blame it on Rachel Ashwell, the queen of shabby chic. 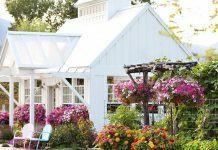 When Peggy Kurz visited one of Rachel ’s shops, she fell in love with the look and was soon redesigning her home and garden. It’s been more than 20 years since Peggy Kurz’s daughter took her to Rachel Ashwell’s shop in Chicago. The visit so influenced her she came home and painted everything white. The shabby chic design concept was inspired by flea market finds. And once Peggy decided to adopt that look, she and friends started checking out the different antiques shows and flea markets. 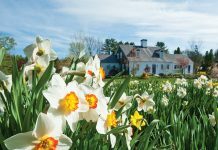 Peggy laughs when she shares, “I have lived in the house over 40 years and have gone through a lot of different decorating styles including Victorian and collecting cows.” But it looks like this style is a long-lasting favorite of Peggy’s, not only for the interior of her house but for the garden as well. 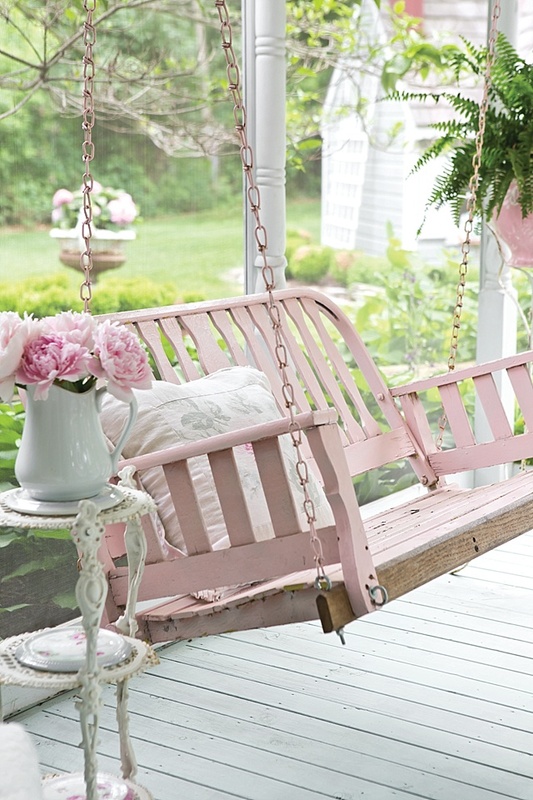 The same shabby chic design principles of using timeworn furniture and feminine accessories are also popular in gardens. 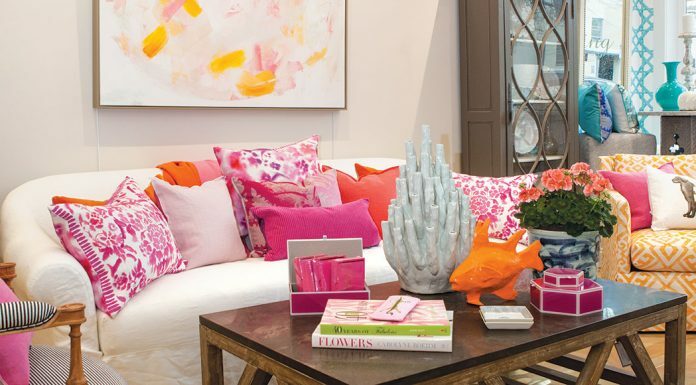 The color scheme usually includes neutral colors with pale accents of pink and blue. And when you step out onto Peggy’s screened-in porch you will find just that. “The oak swing was bought around 10 years ago,” she says. “It was already pink, but I gave it another coat to touch up.” Garden-fresh peonies sit on a side table, and a Boston fern fills a pink antique jardinière. Peggy’s first endeavor into the backyard design was the addition of a split-rail fence and a perennial flower garden. 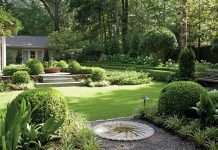 When the maintenance for the garden became too much, she switched to boxwoods and roses. 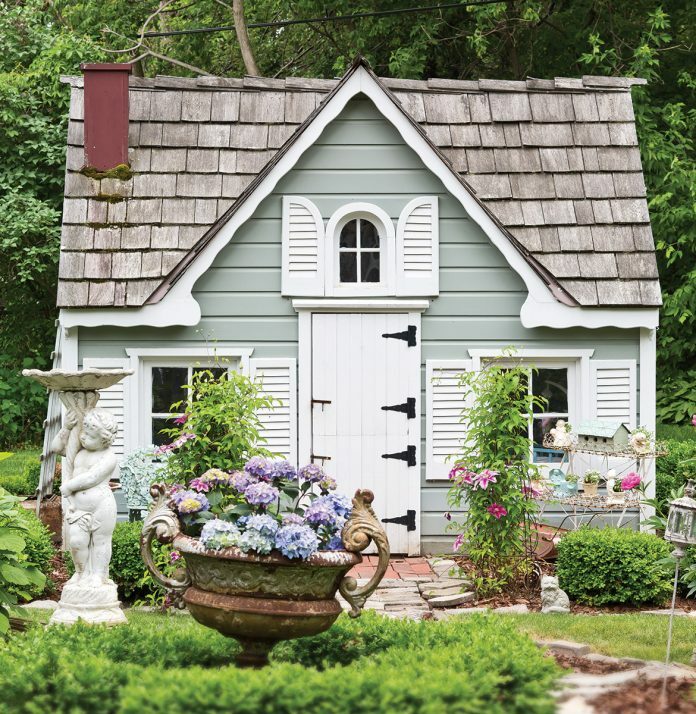 The focal point of the garden is the little cottage. 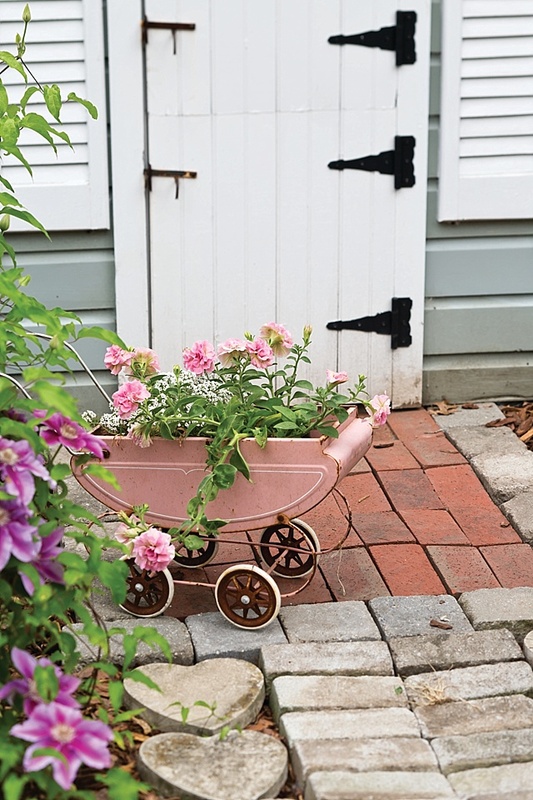 Purchased for her granddaughter and made by Amish builders, it was originally pink and featured shutters and hinges and other charming details. As her granddaughter grew older, Peggy repainted the cottage for her grandson. Just outside the front door grows a pink peony bush and purple clematis. The flowers sign was bought at the Springfield Antiques Extravaganza in Ohio. The husband of one of the dealers made it using pieces of old tools for the letters. The “w” is made from the tines of a garden fork. The white cast-iron table is Victorian, and the chairs, which are extremely heavy, date from the 1800s. 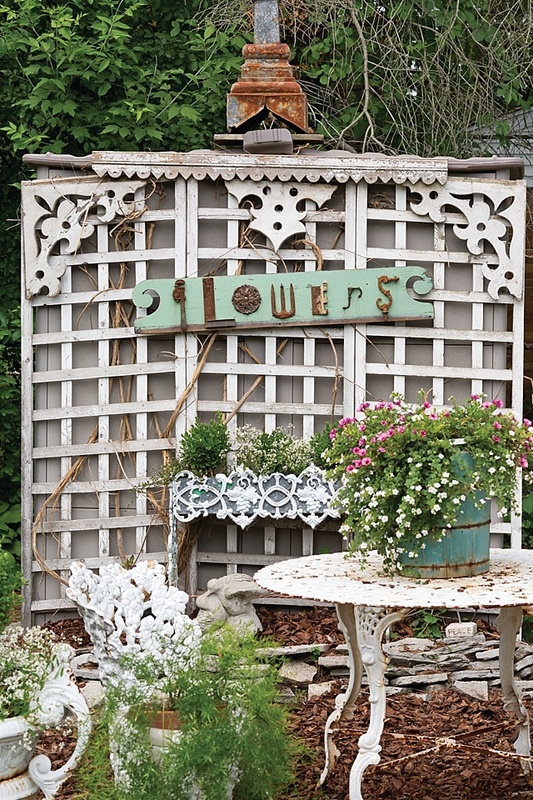 In addition to her garden flowers, she also boasts a collection of found treasures that add to her shabby chic backyard style. “I saw an aqua buggy in a magazine and loved it,” she says. 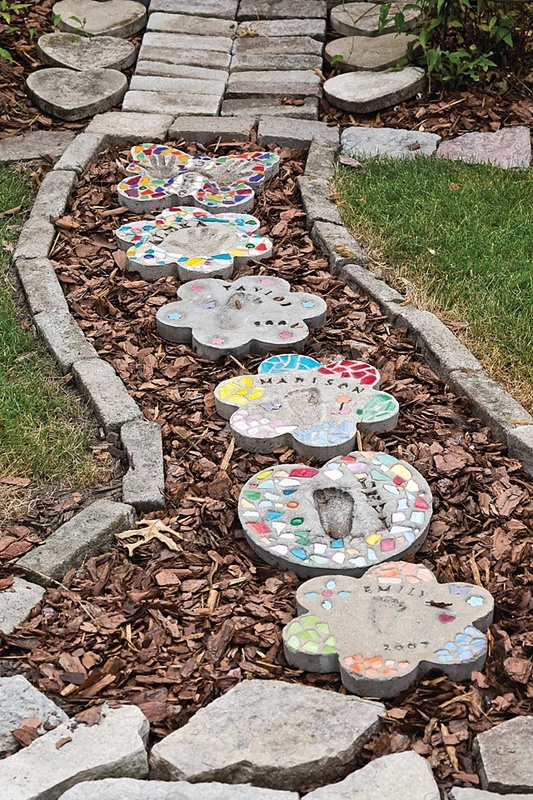 “And then I found this pink one just like it at a flea market for $12.” Her grandchildren made the stepping-stone path leading to the cottage; each child decorated a different stone with imprints and ceramic chips. 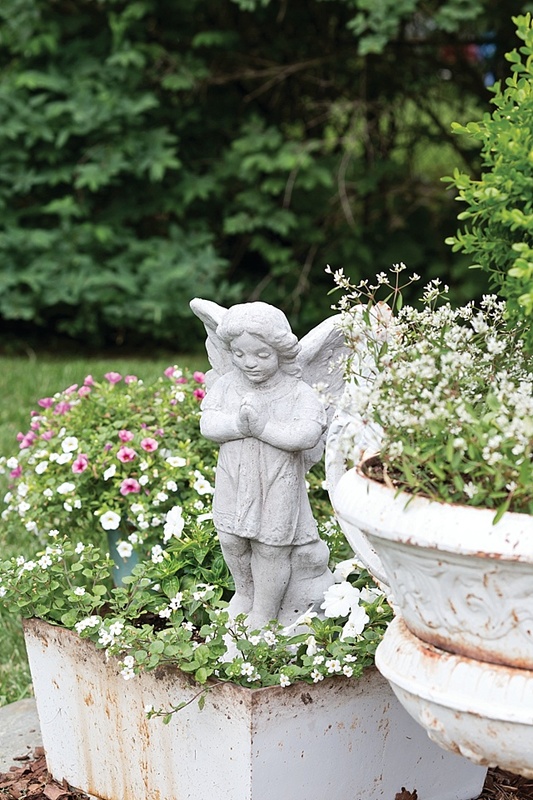 The fun of the hunt and time with friends selecting items for her yard makes Peggy’s garden a special place for her to welcome the early morning and relax in the late afternoon. Sign up to receive our email newsletter and important updates! 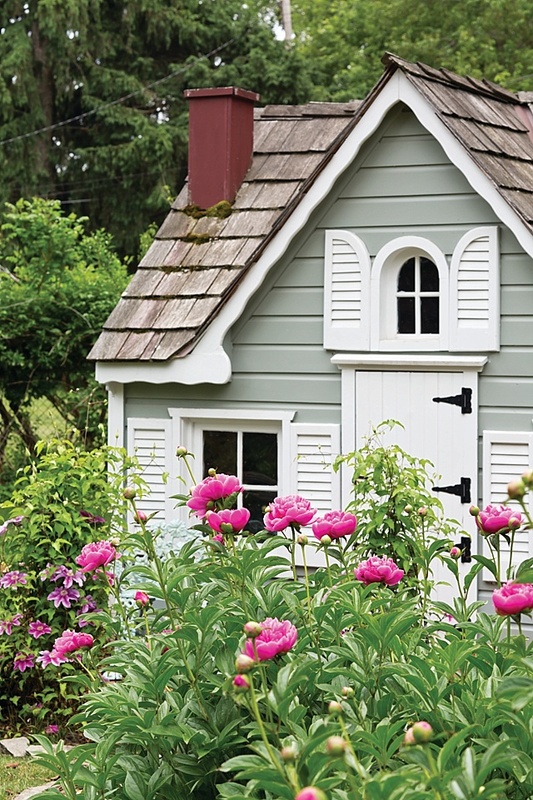 Glean ideas from classic cottages to create the lifestyle of your dreams. In every issue, The Cottage Journal will offer you the most delicious recipes and menus, easy entertaining ideas, fresh decorating tips and creative inspiration for a relaxing retreat.